The drink is made with muddled strawberries and basil mixed with agave nectar and fresh lemon juice. CHELSEA — If summer drinking is starting to weigh on you, 10th Avenue's Fillmore Room has a new low-calorie, agave-sweetened cocktail. The Strawberry Smash combines "guilt-free" vodka, muddled strawberries, basil, fresh lemon juice and agave syrup, said Fillmore Room spokeswoman Sarah Bremen. It's approximately 152 calories with 22 grams of carbs, with 17 of the 22 coming from low-glycemic agave, Bremen said. 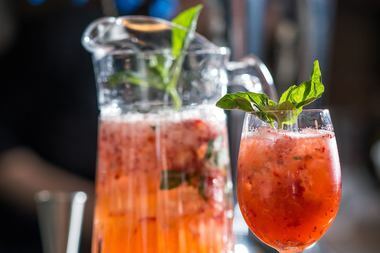 An individual Strawberry Smash is $14 and a pitcher serving four to six people goes for $60. The Fillmore Room, which took over the space formerly used by Moran's on West 19th and Tenth Avenue this spring, has a sidewalk cafe for outdoor sipping.